The Disarmament and Security Centre (DSC) is a not-for-profit charitable organisation based in Aotearoa New Zealand. The DSC was established in 1998 in Christchurch. Today, we operate as primarily a virtual Centre connecting disarmament experts, lawyers, political scientists, academics, teachers, students and disarmament proponents. DSC team at the New Zealand Mission to the United Nations in NYC. Meeting with Disarmament Ambassador Dell Higgie to discuss the draft Treaty on the Prohibition of Nuclear Weapons. The DSC provides a resource centre for alternative thinking on disarmament and security issues, both within Aotearoa New Zealand and internationally. Currently the work focuses on reinvigorating public awareness on disarmament issues by implementing the recommendations from the 2002 United Nations Study on Disarmament and Non Proliferation Education. Examples include educating about New Zealand’s nuclear free legislation, the World Court's 1996 Advisory Opinion on nuclear weapons and its implications, the 2017 Treaty on the Prohibition of Nuclear Weapons, the fallacies of nuclear deterrence, and offering safer alternative security strategies. Disarmament and Security Centre Coordinator, Lucy Stewart, and Dr. Lyndon Burford, speaking with students from Westlake Girls High School in Auckland. Kate Dewes has co-directed the Christchurch Disarmament & Security Centre (DSC) with her husband Robert Green since 1998. She was on the International Steering Committee for the World Court Project; a member of the Public Advisory Committee on Disarmament and Arms Control; part-time lecturer in Peace Studies at the University of Canterbury for 20 years; the NZ government expert on the UN Study on Disarmament and Non-Proliferation Education 2000-2002, and a member of the UN Secretary-General’s Advisory Board on Disarmament Matters 2008-2013. Robert Green served for twenty years in the British Royal Navy from 1962-82. As a bombardier-navigator, he flew in Buccaneer nuclear strike aircraft and then anti-submarine helicopters equipped with nuclear depth-bombs. On promotion to Commander in 1978, he worked in the Ministry of Defence before his final appointment as Staff Officer (Intelligence) to the Commander-in-Chief Fleet during the 1982 Falklands War. Robert Green chaired the UK affiliate of the World Court Project (1991-2004) and he is the author of Security Without Nuclear Deterrence. Lucy Stewart holds a Masters of Professional Studies degree in International Relations and Human Rights (MPSIRHR) from the University of Auckland. She spent three years teaching children and adults in the Kurdish region of Northern Iraq. 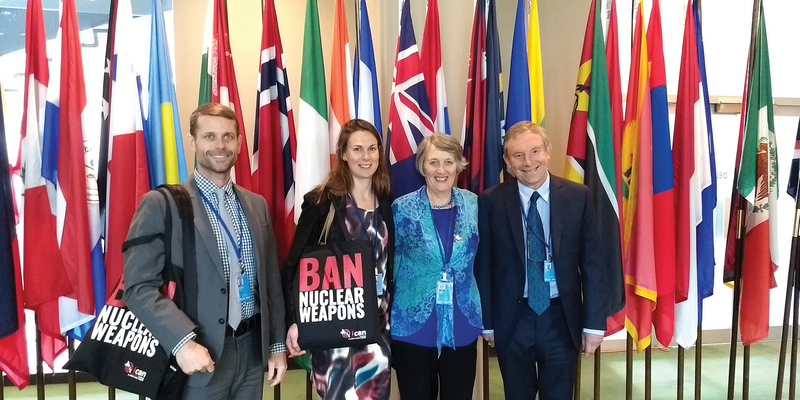 Lucy was on the New Zealand civil society delegation to the United Nations for the negotiations on the Treaty on the Prohibition of Nuclear Weapons in 2017. Lucy was awarded the Quaker Loxley Peace and Service Award in 2017 for her work with the DSC. Read more about Lucy’s work here. Connect with Lucy on Twitter, and LinkedIn.